Juan Carlos “Juice” Ortiz is a fictional character on the FX television series Sons of Anarchy, played by Theo Rossi. John Theodore “Theo” Rossi is an American actor born June 4, 1975. Rossi was born in Staten Island, New York City, New York. Growing up, he loved to ride dirt bikes. Rossi studied acting at the Lee Strasberg Theatre Institute in New York where he appeared in several theatre productions in the short time he was there. Rossi moved to Los Angeles in 1999, and showcased his acting versatility by first appearing in commercials for McDonald's, Nissan, and Bud Light. Since 2001, Rossi has guest starred in many television shows such as Veronica Mars, Bones, Boston Public, American Dreams, Heist, Las Vegas, Grey's Anatomy and Law and Order SVU. He stars in the movie The Challenge with Mary-Kate and Ashley Olsen, Code Breakers, and had a small part in Cloverfield. He also appears in the films Kill Theory, The Informers and Fencewalker. 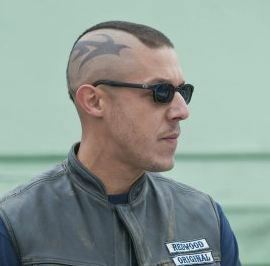 In 2008, he was cast as the recurring role of “Juice” Ortiz in the series Sons of Anarchy, his best known role to date. Due to popular response, Rossi was upgraded to regular castmember in the second season. Ortiz is of Puerto Rican and African-American descent, and is from Queens, New York. He is the Sons of Anarchy's hacker and keeps their technology up to date. He is also in charge of club surveillance, and manages some of the club's intelligence and communication. He is seen as unreliable by Clay Morrow, and is often given menial tasks, such as driving the transport truck. He sports a short mohawk and has matching tribal designs tattooed on each side of his head. Though never directly mentioned, references have been made that suggest he has served in the U.S. Army.